Got down to the house yesterday to get ready for the first day of mini season. I heard several reports from neighbors about a lot of poaching in our area. One boat got caught with 100 tails behind BPK a few days ago.....:machinegun.....We got to my first spot I scouted about a month ago, got anchored, only to have a boat anchor 10 feet away from us.......:hairraiser. They told us we stole their spot and started raising hell.....o yes mini season was officially starting. I went to my next spot about 300 yards away rather than fight with the dip &@!/'s....We got our four person limit of 24 in less than an hour. There were about 30-50 bugs left by the rocks when we left. :dance All were good size, no need to measure but we always do just in case. They are really thick this year, my guess is a lot of people make multiple trips today. It will be interesting to see what is left tomorrow. My family and I had a great morning, now we just need to decide what to do for the rest of the day it's only 11:30!!! Good luck to all stay safe, have fun!!!! Lobbies on the grill for lunch will keep you busy for an hour or two! Keep the feelers from the head out to the first knuckle, boil them and pop them open like crab and enjoy them as appetizers! I was going to say I can't believe someone would say that to you....but considering the setting, I understand. The whole friggin' ocean and they guy has to be an ****....you're a good man to keep your cool. You could not PAY me to go down there for mini. Good luck and keep safe. Way to keep your cool ! Congrats on a great haul and sorry to hear about the other boater, we thankfully did not encounter any of that today. Way to make short work of those bugs, and good call not to make a big deal out of that other guy. Thank you for all the kind remarks! Good luck tomorrow! I already sense some heavy wine consumption to enjoy with a freshly caught and cooked whole hog snapper....we shall see what happens tomorrow!! Something tells me you will be. Looking forward to your reports. We'll be in the same area 6th-10th. I'm thinking the viz will be better this year. I'm looking forward to giving it a shot during early Sept this year. I think I'm going to like being down there without so many people. Plus, if my stuff is picked over a little, there won't be the pressure to catch our limit every day. Might also lead to more scouting and less number hitting! When you get a limit of 24, that's 48 'feelers' so that makes for some great appetizers! Crack 'em open with a nut cracker and enjoy a pinky-finger size piece of lobster meat! Gary M. Please talk me through the cracking & cooking process. How long do you boil? etc. I did try it & they were good but hard to crack & very difficult to get out of shell. Help please. 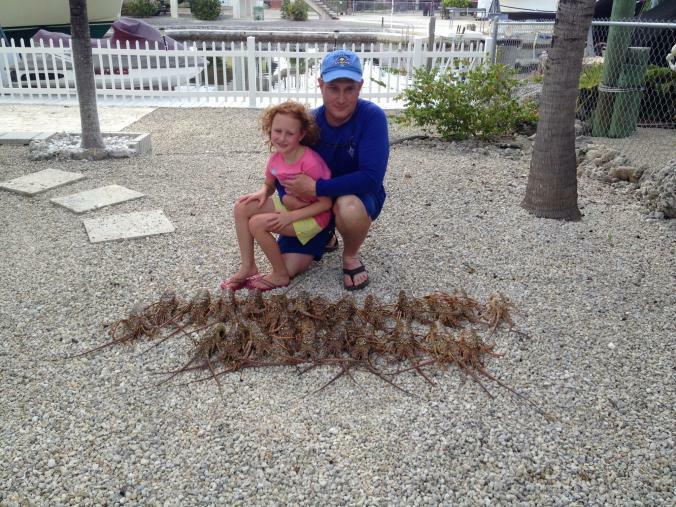 I don't catch lobsters so haven't done/seen that trick in 20-30 years! But I do recall that you need some real nut crackers to bust the meat out. If the meat is not fuly cooked, that makes it harder to get the meat out. Got some friends coming down today and we'll no doubt go out lobstering in the next few days so I'll try my own trick! If I figure out the 'easy way' I'll post it up!